1 - Take half a slice of bread and chew it and chew it and chew it! Even if the bread becomes disgusting, you should still keep chewing amd remember - don't swallow or you'll spoil the experiment! 2 - Pay attention to how the flavour of the bread changes. 3 - Once you think you have the answer, you can swallow the bready mush or (this is probably best!) spit it out. As you chew the bread, you may have noticed that it slowly tastes sweeter. Why? Bread is made up of starch and starch is made by plants. But how do plants make starch in the first place? When plants take in light, they convert it into sugars through a process called photosynthesis. Once the sugar is made, they need to store it in their cells. The problem is that when there is a lot of sugar in a cell, the proportion of water in that cell is less relative to a cell with hardly any sugar in it. If there are some cells with a lower water concentration (or more sugar) than others, then a concentration gradient is established. This can be thought of as a slope: at the top of the slope are cells with lots of water (and little sugar) and at the bottom of the slope are cells with relatively little water (and lots of sugar). If you put lots of water at the top of a slope, then it will trickle down to the bottom. This is exactly what happens in cells: the cells with a high concentration of water have some of their water sucked out and it is taken up by the cells with a low concentration of water. This continues until all the cells have an equal concentration of water and the gradient (or slope) disappears. This process of water moving between cells depending on the concentration of other small molecules (such as sugar) is called osmosis. So what's the problem? Well plant cells are surrounded by a tough cell wall made of cellulose, and this gives the cell strength. However, if the cell is full of sugar from photosynthesis and water from other cells rushes in by osmosis, then the cell wall starts to strain. If too much water enters the cell, the cell wall will eventually give way and explode - just like a balloon that's been blown one puff too far. Exploded (and thus dead) cells are bad news for plants, so they've had to come up with a cunning storage solution. What they do is take all the sugar molecules and glue them together into a long chain. It is this chain of sugar molecules that we call starch. Because starch is a long molecule, it doesn't alter the overall water concentration (or osmotic pressure) of the cell like small sugar molecules do. This means that having starch in the cell doesn't establish a large concentration gradient, doesn't cause water to rush in, and the cells don't explode. When we use plants to make food such as bread, it is still in its starchy (or long chain carbohydrate) form. This is great, but we can't absorb it into our bodies in this long chain form. The only way round it is to chop it up. Thanks to evolution, there's an enzyme in our spit called amylase which specifically cuts up starch and turns it back into small sugar molecules. 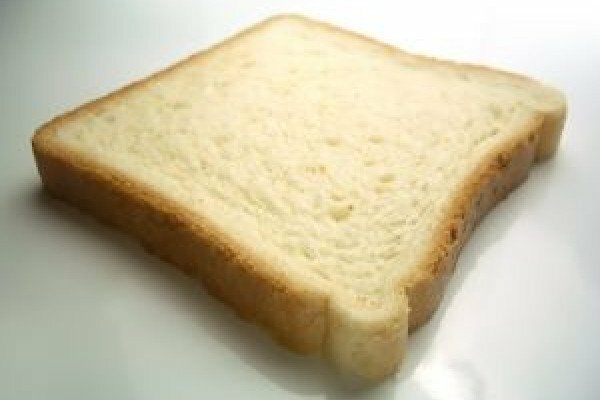 This is why the bread starts to taste sweet after lots of chewing - the amylase enzyme is breaking down the starch and turning it into glucose. Amylase isn't the only enzyme to break down food into molecules we can absorb. Another example is the enzyme lactase. This breaks down lactose (which we can't absorb) into galactose and glucose (which we can). People who stop producing lactase will stop breaking down lactose, meaning that lactose is left behind in the gut. Bacteria that live in the gut see this otherwise ignored lactose and begin to break it down themselves. This produces large quantities of gas, and explains why people with lactose intolerance find that they become rather windy after a glass of milk. The lactose is acting as the fuel for a large bacterial fermentation plant! Previous How fat would you have to be to stop a bullet? What happened to the biscuit as you chew it? When chew an hard biscuit .What happens to the carbohydrates in it? what test could confirm this idea? I have a question. We take a bread keep it in our mouth for sometime and then take it out from our mouth and keep it in a beaker. We then add iodine solution to it. What will be the colour of the bread? it depends how long it is in your mouth for. if it was in for a short period of time, it will probably turn black/blue with the iodine as not all the starch has been broken down by the amylase in your saliva. however, if it was in for a long time , it is likely the the amylase in your spit would have broken down all the starch and the iodine test will be yellow. Will this work with wheat bread? Yes, it should do; wheat bread contains starch capable of being broken down by ptyalin to glucose, so it will taste sweet.